Emotional pain often causes a toll on one's quality of life than physical pain. Negative emotions and stress can even lead to physical pain and disease. In fact, emotional stress is related to health problems including lowered immune function, increased blood pressure, altered brain chemistry and more. Recognize all your feelings: Are you angry? Or are you depressed? Give some thought to how you're feeling. This can be very helpful in processing all of your emotions in the wake of a life changing or disturbing event. Get your mind off how bad you feel: You definitely have the right to feel sorry for yourself- for 10 minutes. Then, move on. Don't lock yourself up; you need to distract yourself by just forgetting it for a little while. Remember that grief needs to take a breather and give yourself a little time to just be without obsessing on the event, this will help you heal and move on. Don't let your pain delineate you: Keep in mind that you are greater than this hard time. You have creativity and awareness and this single episode will soon pass. Avoid using statements that blame you or others: Take accountability of your own actions, but don't indulge in blaming. The question of "Whose fault it is/was that?" should be ruled out. Healing takes time: You will need to develop patience to allow healing to begin. There isn't any alternative for waiting. Talk to someone: Try to talk out your feelings to someone you trust, it can help you start healing. Just realizing that someone wants to be there for you will make a difference. Avoid pretending that you don't feel it: You have to address the emotional pain you're experiencing, or you will never get beyond it. Masking your pain when you're at work or when you're trying to get through each day may be necessary to an extent but make sure you have some "me time" to address these feelings rather than just suppressing and denying them. 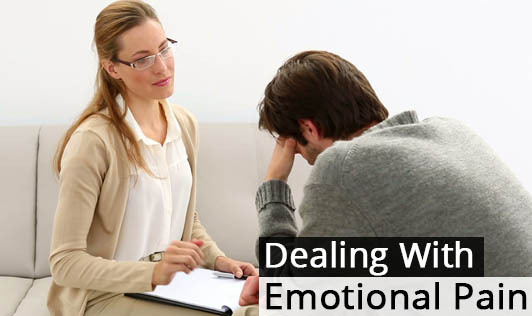 "These are some healthy ways to deal with emotional pain. But if the pain lasts for more than a week or two and you've lost hope, get professional help. Talking to a counsellor may help you get through this difficult phase."